Throughout the year I'll be bringing you some interviews with the authors over at the Class of 2K12! I hope you will enjoy getting to know these authors and thoughts on their books better. 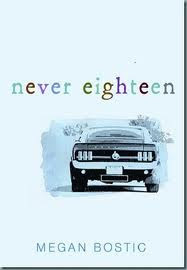 Today Megan Bostic shares some thoughts on her book, Never Eighteen. How has your personal history influenced your writing of your book? My personal history has greatly influenced me in writing Never Eighteen. I cared for my mother-in-law as she was dying of cancer, so I saw firsthand the effects of the illness and the treatments for it as well. And all the problems Austin’s friends and family face? I’ve faced these same problems either personally or indirectly through friends and family. It’s funny, because people have said that maybe it’s too unbelievable that so many people Austin knows have these issues, but truly I’ve known people with every single one of these struggles, and I’d bet most people out there do too. I don’t want to elaborate because I don’t want to give away too much of the book. How did you react when you saw the cover of your book? Honestly, I wasn’t really sure if I liked it, or maybe, it just wasn’t what I expected. I guess I was expecting something dark and dynamic. My editor alleviated my reservations. First, she explained to me that just about every cover on bookshelves these days is black. The light blue color of my cover will stand out from the rest. Also, the artwork on the cover is original, and I LOVE the mustang—I’d rather have original art than stock art. The cover is also androgynous; it would appeal to boys as well as girls. I did have them change the color from a creamy yellow to the soft blue it is now. In my opinion, my cover is uber cool, and I’m totally in love with it. What was your reading life like as a child? I love to read—always have. I read all the time when I was a kid, a virtue my mom instilled in me. Mysteries were some of my favorites growing up. I used to read the Hardy Boys, Nancy Drew, and Encyclopedia Brown. I also liked poetry a lot. I used to read Robert Louis Stevenson’s, A Children’s Garden of Verses, over and over. The Judy Blume books were probably my favorite, Tales of a Fourth Grade Nothing, Blubber, and my all-time favorite, Are You There God It’s Me Margaret. I went from Judy Blume to S.E. Hinton, and then at about thirteen, straight to Stephen King. The last book I read was from a very talented debut author and member of the Class of 2K11, Bettina Restrepo. The title is Illegal, and it’s about a girl and her mother crossing the border from Mexico into Texas after the disappearance of her father. It’s a very heart rending, but thoughtful novel. I highly suggest it. How do you feel about book blogs and using social media? In this day and age, I think both of these media aspects are very important to writers, especially debut writers. With the economy the way it is today, publishing houses just cannot put much money into publicizing their authors -- this goes double for unknowns. Social media has made it easier for authors to market themselves. Facebook, Twitter, and Youtube have become very effective tools for the self-promoting author. Book bloggers are also instrumental in getting authors out in front of the masses. They always seem so willing to help a debut by doing interviews, reviews, and blog tours. I think without social marketing and book blogging, writers would have an extremely difficult time marketing their work. Would you rather deal with an alien invasion or a zombie apocalypse? I would much rather deal with a zombie apocalypse. Aliens would more than likely be more intelligent than humans, plus have better technology, making our weaponry look primitive. Zombies are slow and stupid and most the time can be killed by merely cutting their heads off. What’s your biggest guilty pleasure food? Definitely pizza. I’m Italian after all. I love it! I could eat it every day and wish I could. Any kind of pizza will do, just hold the anchovies. Presently I’m writing a novel about a girl who is a self-harmer (cutter). It’s about the events that steer her to that dark place and what it takes for her to recover. The tentative title is Sad, though I’ve thought about changing the name. About Never Eighteen: Austin Parker is on a journey to bring truth, beauty, and meaning to his life. Austin Parker is never going to see his eighteenth birthday. At the rate he’s going, he probably won’t even see the end of the year. The doctors say his chances of surviving are slim to none even with treatment, so he’s decided it’s time to let go. But before he goes, Austin wants to mend the broken fences in his life. So with the help of his best friend, Kaylee, Austin visits every person in his life who touched him in a special way. He journeys to places he’s loved and those he’s never seen. And what starts as a way to say goodbye turns into a personal journey that brings love, acceptance, and meaning to Austin’s life. You can learn more about Megan at her website.